Things You Can Do With A Pfand Chip – Sunshine. Whimsy. Tacos. I have this little blue Pfand chip. These chips come in all shapes, sizes, materials, and colors, but this one is pretty simple. 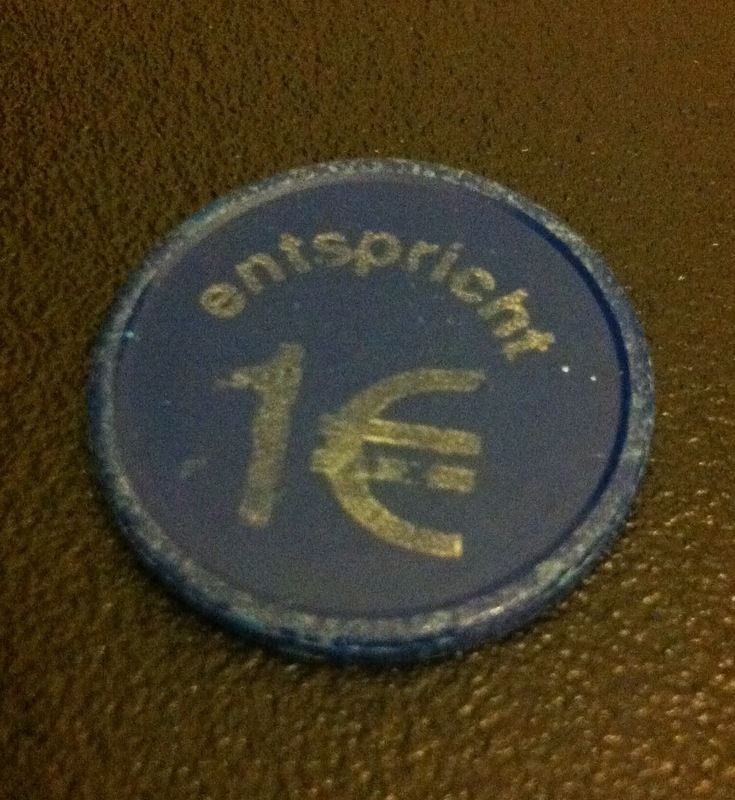 It’s the same size as a one Euro coin. At outdoor events, you pay an extra fee for your beverage, and these chips are commonly handed out at the same time. When you finish your drink, you bring the empty back, along with the chip, and you get your deposit back.Some people collect the chips from different events. That’s another story, though. Grocery stores use them also- the shopping carts are locked together outside, and you need a one Euro coin to unlock a cart. Grocery stores sometimes sell their own little chips that are the same size and shape to fill this function. When you re-lock the cart to its brethren, your original coin or chip pops right out into your hand. Those are some of the most common uses for a Pfand chip. I use it differently, though. Since my arrival in Regensburg, I’ve dined out quite often with Jenny- she rapidly became my closest friend in Germany. In the early days, we would forget pretty easily who payed for the meal last because it’s just easy to lose track. We have joking nicknames for it: The Debt Chip. The Payment Turn Designation Device. We use it as a marker- the person holding the chip pays for the meal, and the chip changes hands when we’re done. There’s a mild amount of silly pomp and circumstance to the handing off of the chip at the end of a meal, but it’s all in good fun. We don’t include other people in the hand-off of the chip. If her boyfriend is with us, we pay separately by unspoken agreement. I’ve always believed that when you’re friends with someone, you eventually forget who has paid for more of your shared meals. This little blue chip is challenging that long-held belief, but I don’t think I mind. Our friendship isn’t ever diminished in the slightest by knowing who paid last. PSA: DB Info Is Now Available On Google Maps! That’s clever on several levels. b) it bridges the gap between German and American expectations of friend/colleague behavior when it comes to “invitations” to a meal/drink. Have you been bitten by that before? You say, “thanks for inviting me to dinner” and they get all cautious and defensive and suspicious (and rightfully so, if you know where they’re coming from), replying with “Wait a minute — I didn’t agree to pay for you!” Awkwardness frequently ensues. Your token exchange lets you preserve your easy-going American let it ride, I-gotcha-next-time, no-big-deal tendencies while guaranteeing that the German can play along with no fear of undefined rules or unmet expectations. Surprisingly, Cliff, I haven’t run into the invitation thing you describe. Most of the Germans that I dine with are super-familiar with American custom and many work for the same company I do, so it hasn’t been a concern.